One of this year’s big films for children was the Lego Batman Movie, in which Batman tries to save Gotham City from his arch rival, The Joker. Having been released on DVD also, no doubt your Lego fan will have seen it several times, at least, and would love to re-enact scenes with this set at Christmas. If your kids love superheroes, the LEGO Superheroes Batman: Man-Bat Attack is perfect. 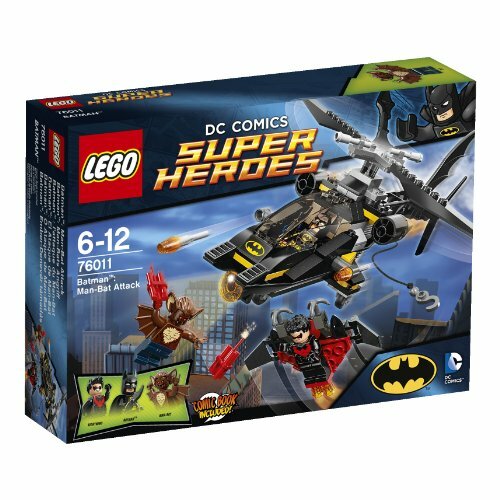 Inspired by one of the most popular DC superheroes, this playset features the iconic Batman along with 2 other mini figures, a fully functional Batcopter and much more. Your kids can use this playset to take the skies as Batman or Nightwing and battle it out with the villainous Man-Bat using a range of weapons and vehicles. Batman Branding: The LEGO Superheroes Batman: Man-Bat Attack is a real treat for fans of Batman. The Batman mini figure is amazingly detailed and features a batsuit (complete with the yellow and black Batman logo, a yellow utility belt and a torso outline), cape and helmet. The Batcopter also features similar, high quality Batman branding and the set even includes a Batarang that can be used by the mini figure. Kids who love Batman will really appreciate all these references to their favourite superhero and get much more enjoyment from this LEGO set because of them. Lots Of Functional Features: LEGO are well known for creating highly functional, interactive playsets and the LEGO Superheroes Batman: Man-Bat Attack is no exception. The Batcopter includes rotating blades, flick fire missiles and a fully operational winch and hook which can directly attach to the grapples on Nightwing’s glider. Your kids can also equip the mini figures with dynamite or a Batarang. They’ll have lots of fun exploring all these features and want to come back to this set time and time again. Characters: One area where LEGO Superheroes Batman: Man-Bat Attack could be improved is the choice of supporting characters. Nightwing and Man-Bat are both lesser known Batman characters and it would have been nice to see more familiar faces such as Robin, The Joker, The Riddler, Bane or Two Face included in this set. Having said that, Nightwing appears to be a very popular addition in reviews. Whether your little one loves Batman or simply enjoys playing with LEGO, the LEGO Superheroes Batman: Man-Bat Attack is well worth purchasing. The figures and vehicles are lots of fun, it’s a highly functional set and it’s great value for money. This is a great addition to the Lego Superheroes range, and your youngster will love re-creating their favourite scenes from the movie.